The Business + Education (BE) Engaged Summit 2017 is a direct invitation to Southern Nevada’s business leaders to become involved in solutions which are improving the public education system. Through donations of time, talent, and resources, business leaders can have a direct, positive impact on improving student proficiency and ultimately strengthening the region’s ability to attract new businesses in the future. Clark County School District Superintendent Pat Skorkowsky moderates a discussion about student literacy and achievement levels for English language learners during BE Engaged Summit in 2016. Nevada business owners and executives are joining Southern Nevada’s leading business organizations to support effective educational programs, improved student outcomes, and create a pathway to a more diverse economy in Southern Nevada at this year’s Business + Education (BE) Engaged Summit 2017. The summit, which takes place on Wednesday, March 29, 2017 from 7:30 a.m. – 1 p.m., at The Smith Center, seeks business participation and support of educational improvements through commitments of time, talent or resources. The event this year is again co-sponsored by a diverse group of business organizations, including: The Las Vegas Global Economic Alliance (LVGEA), Las Vegas Metro Chamber, Henderson Chamber of Commerce, Latin Chamber of Commerce, Urban Chamber of Commerce, Asian Chamber of Commerce as well as the Council for a Better Nevada and The Smith Center for the Performing Arts. Corporate sponsors include Bank of Nevada, Station Casinos and VegasPBS. The 2017 BE Engaged program will again focus on specific areas of need within the public educational system, and the possible solutions to address those needs. This year’s discussion topics will include a “Workforce Report Card” presentation by the LVGEA that clearly illustrates the important relationship between education and economic development; attracting business leaders as mentors for public school principals dealing with material organizational and cultural changes under AB 394, the Clark County School District reorganization plan; early literacy programs that are improving reading and comprehension proficiency; and efforts to expand Science, Technology, Engineering and Math (STEM) curriculum in Nevada. Immediately following the BE Engaged main program, and before a keynote luncheon presentation by Google’s Jaime Casap, business leaders will have the opportunity to network with Nevada nonprofit executives, who will also be seated at each table, and will illustrate their specific programs which are addressing unmet educational needs and improving student outcomes. Many of these programs could expand educational improvements to a wider student population with additional support from business leaders. Google Chief Education Evangelist, Jaime Casap, will be the luncheon’s keynote speaker. Casap was part of the original team that launched Google Apps for universities and K-12 classrooms. As Chief Education Evangelist, Casap brings awareness to the power and potential of the web, technology and Google tools to create powerful learning models. Born and raised as a first generation American to a single mother on welfare in Hell’s Kitchen, New York, Jaime fully understands the power that education has on changing the destiny of a family in just one generation. 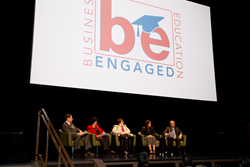 Now in its second year, The Business + Education (BE) Engaged Summit is led by a team of volunteer community and business leaders, and nonprofit organizations that understand improving educational performance is essential to the growth of Nevada’s economy. Last year’s inaugural BE Engaged Summit resulted in a $1.4 million in-kind donation of Science, Technology, Engineering and Math (STEM) curriculum and teacher training for Nevada’s public middle schools by the STEM Academy, Inc. Furthermore, many of Nevada’s businesses have partnered providing funding and mentoring commitments in support of nonprofit programs which are addressing educational gaps and leading to improvement in student performance. “The Las Vegas Metro Chamber, as the largest business organization in Nevada, has been at the forefront for decades for advocating at the local, state and federal levels for the policies, funding and accountability necessary to improve education for the benefit of students and employers. The Metro Chamber is proud to join with other members of the business community as we work together to do our part to ensure our students are workforce ready, now and into the future,” says Bill Noonan, 2017 chairman of the Metro Chamber and senior vice president of Governmental and Industry Affairs with Boyd Gaming. Tickets for the event can be purchased by calling The Smith Center box office at (702) 749-2000 or going online to http://www.TheSmithCenter.com The cost is $20 per ticket for the BE Engaged program. A separate VIP luncheon, limited to 500 guests, is $50 per person. Ticket price includes VIP luncheon and seating for the morning’s BE Engaged program. 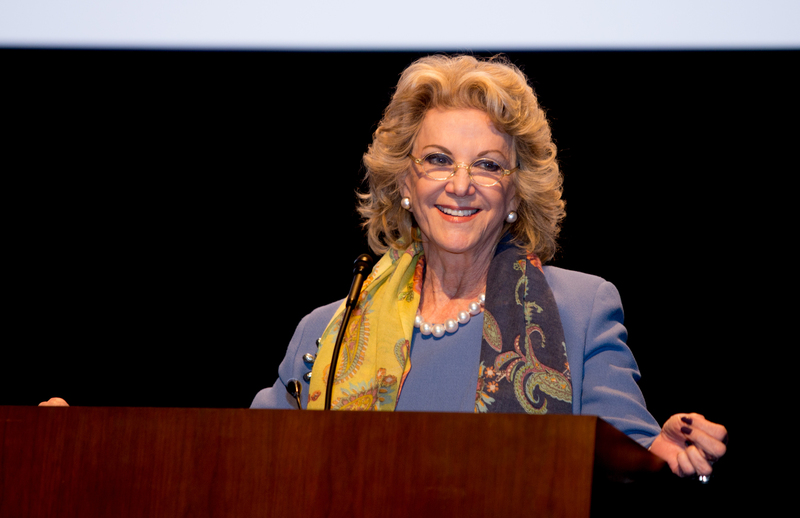 During the 2016 Business + Education (BE) Engaged Summit, Elaine Wynn spoke to attendees on the need for Nevada businesses to join efforts improving educational outcomes.